Weekly Notes and News Regarding NMSU Athletic Teams for the Week of 1/28/14. Also upcoming Events. The Aggies look to wrap the first half of conference play with road games against Bakersfield and Utah Valley. NM State meets the Roadrunners on Thursday, Jan. 30 at 8 p.m., and then makes the trip to Orem, Utah to face the Wolverines at 3 p.m. on Feb. 1. Fans can listen to the live broadcast with Jay Sanderson on KSNM AM570. The New Mexico State women’s swimming and diving team will divide in two for the season’s final competitions before the WAC Championships. The swimmers will swim in a dual meet in Albuquerque, N.M., versus in-state rival New Mexico on Saturday, Feb. 1, beginning at 12 p.m. (MT). The divers, meanwhile, will participate at the Falcon Diving Invitational in Colorado Springs, Colo., which runs from Thursday, Jan. 30, thru Saturday, Feb. 1. The New Mexico State men’s tennis team continues its spring schedule with four matches, including a Saturday doubleheader, in Las Vegas, Nev. The Aggies begin their week with a matchup against UNLV on Friday, Jan. 31, beginning at 10 a.m. Saturday’s doubleheader begins with a dual versus UC Riverside at 10 a.m. followed by a matchup with Southern Mississippi at 2 p.m. NM State concludes its weekend trip by facing Weber State on Sunday, Feb. 2, beginning at 10 a.m. Follow @NMStateMTennis. The New Mexico State women’s tennis team begins its spring schedule by facing the University of Arizona in Tucson, Ariz., on Sunday, Feb. 2, beginning at 9 a.m. (MT). The dual match will be one of two for the Aggies in Tucson as they also face the University of San Francisco on Monday, Feb. 3. The New Mexico State track and field team travels to Lubbock, Texas, to compete in the Masked Rider Invitational on Jan. 31-Feb. 1. The Aggies look to make improvements after facing many quality athletes at the Cherry and Silver Invite (Jan. 25). NM State also looks to its freshmen to continue their development and continue to help the team as the season progresses. The New Mexico State men’s golf team is set to open its 2014 spring season Jan. 27-28 at the Arizona Intercollegiate hosted by the University of Arizona in Tucson, Ariz. The tournament will take place at the par-72, 7,282-yard Sewailo Golf Club. The tournament format will include 36 holes on Monday, followed by 18 holes on Tuesday. Freshman Travis Benson, junior Pat Beyhan, sophomore Kenneth Fadke II, junior Brett Walker and senior Zach Adams will represent NM State in the first tournament of the spring. The No. 4 ranked New Mexico State Equestrian team will open the 2014 spring season against No. 1 South Carolina, Saturday, February 1 at the NM State Equestrian Center. The Aggies are currently 8-1 on the season, winning their last seven competitions. Start time of the event is 9 a.m., and admission is free to the public. The NM State Equestrian Center is located at the corner of Sam Steele and Union and fans can park in the dirt lot off of Sam Steele. The New Mexico State men’s basketball team continues WAC play this weekend. First the Aggies take on Bakersfield on Thursday, January 30 beginning at 7 p.m. NM State then faces WAC leader Utah Valley on Saturday, February 1 at 7 p.m. Saturday night is also Hall of Fame night as Voice of the Aggies Jack Nixon, former men’s golfer Scott Lieberwirth and former women’s basketball player Melanie Maynes-Alfaro. Double Player of the Week for Mullings. DENVER – The Western Athletic conference announced that the New Mexico State softball team is the preseason favorite to win the 2014 league title. The preseason All-WAC team was also announced with junior Staci Rodriguez and sophomore Emma Adams named to the preseason team. The preseason poll is a vote of the conference’s six head coaches, who could not vote for their own team. The coaches also select the preseason all-WAC team. LAS CRUCES – The NM State football team will be hosting a signing day party for the whole community on Wednesday, February 5th beginning at 5:00 p.m., at Danny Villanueva Victory Club on the third floor of the Stan Fulton Athletic Center. Doors open at 5 p.m., with the program beginning at approximately at 5:45 p.m. This special celebration of Aggie football will allow fans to meet head coach Doug Martin and his staff. In addition, the new players that have signed up to be Aggies will be presented to the community. This is a free event and everyone is invited to attend this special celebration and presentation of Aggie football. Join other NMSU Alumni in the Seattle Area February 8th and support the NMSU Men's Basketball team as they take on Seattle University! 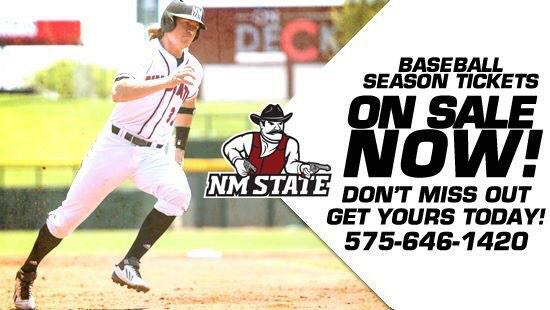 The NMSU Alumni Association has reserved a discounted ticket block for alumni and friends. The seats are on the lower level and will be behind the Aggies bench for easy cheering! Members Only Event - must be an Aggie Athletic Club member at the $100 Level to attend. Purchase a membership on-line - CLICK HERE or call our office 575-646-5151.